Over the years I've started to understand the importance of really looking after my hair. 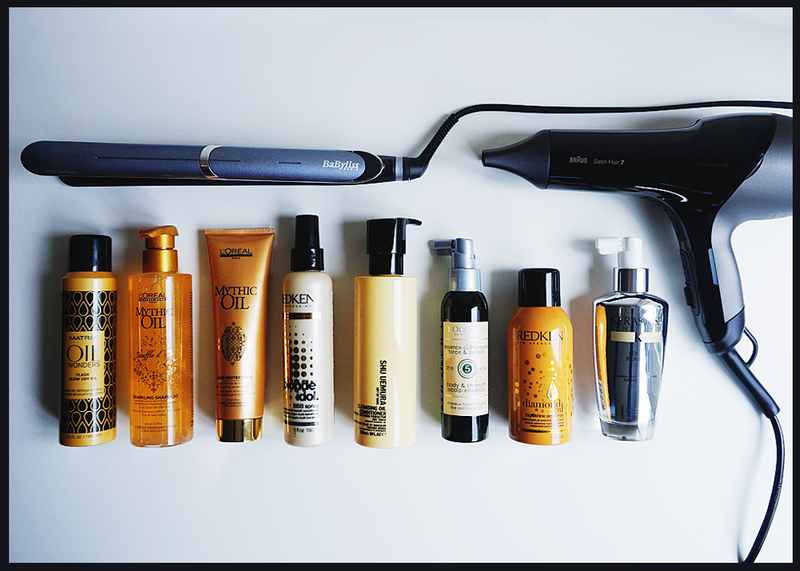 And here are my top ten hair care favorites that have proven to work for me. For a long time I've been avoiding straighteners as I considered them to be too damaging for my hair. That was before I discovered this gentle yet so effective styler by Babyliss, both on dry and damp hair. Another holy grail for damage-free drying is this Braun Satin Hair 7 hair dryer, with IONTEC, constant heat control and moisturizing feature to restore the shine and health of your hair. To reduce the blow drying time I use this Matrix oil spray infused with Moroccan oil. Blow drying goes up to two times faster and my hair looks visibly spoiled with shine and suppleness. My absolute favorite for soft, clean, supple and brilliantly shiny hair. Although I finally found the most gentle straightener and blow dryer I still wrap my wet hair with this nurturing and protecting oil-in cream. My go-to lightweight conditioner for ultimate moisturizing. It works as a rinse-out and as a leave-in treatment. I prefer the last one. As a rinse-out I'd suggest you all give this Shu Uemura miracle worker a try. This lightweight conditioner not only nourishes and conditions the hair but also rebalances the scalp. A revitalizing serum with essentials oils and straightening amino acids stimulating the scalp and limiting the fall of fine and fragile hair due to breakage. The ultimate finishing touch! This revolutionary hair shine spray enhances dull hair like no other and leaves an impressive diamond-like shine. For immediate younger looking hair with increased density, more shine, more volume and more softness. This Kérastase serum is your life saver for rediscovering younger looking hair. Altijd leuk om nieuwe producten te ontdekken!